I listened to a talk by Justin Minns recently. Justin is a fabulous landscape photographer as you can see from his site. The talk was an inspiration. I was particularly motivated as I was just about to leave the following morning for a few days photography in the Lake District. Justin Minns described the research and preparation that he puts into a photo shoot. Planning the route, the parking, the weather, the time of day (usually dusk or dawn), and the position of the sun on that day. He will then walk the site prior to the shoot looking for that killer composition. Like other great landscapists like Charlie Waite and Joe Cornish, Justin will envisage the image that he would want to achieve. Plan to achieve it and then set up his camera and tripod and wait for the light. In landscape photography, it is all about composition and light. 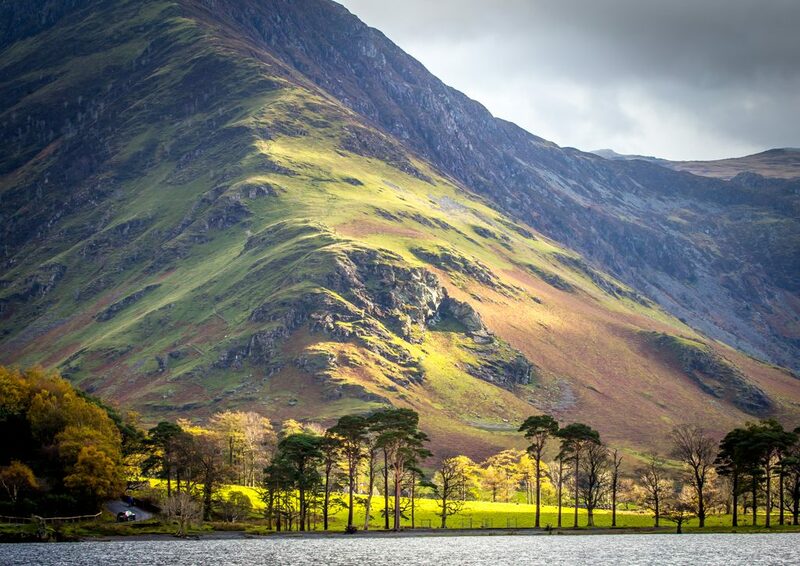 The Lake District is a location with dramatic scenery. When it is not raining and the light is right, there is probably no location in the world that is better for landscape photographs. The Lake District is quite a compact only 912 square miles, so it can be traversed several times in a day. However, it does have 16 million visitors a year so try to visit off season so that you can park to get that shot. On this visit, I decided to take Justin’s advice and plan in advance. I would catch the sun traversing Fleetwith Pike at the southern end of Buttermere Lake. There is a pebble beach on the road side of the lake. I would wait there until the sun broke through the clouds and lit up the mountain, profiling the trees on the shore of the lake. I stayed there for about an hour waiting for the sun and suddenly there it was. The shot I had planned was in front of me. I love street photography because you arrive at a location not knowing what is going to happen, so I was sceptical that I would enjoy this structured approach. However, there is some satisfaction in seeing a plan come to fruition.